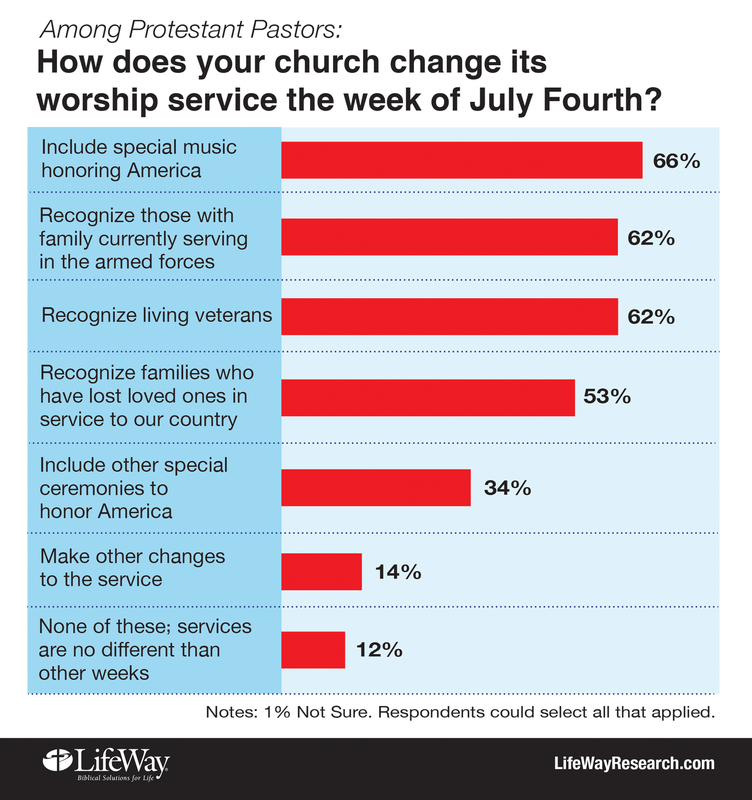 Six in 10 Protestant pastors (61 percent) say it’s important for July Fourth worship services to incorporate patriotic elements to celebrate America, according to a survey by Nashville-based LifeWay Research. And while they plan to celebrate the birth of the nation, more than half (53 percent) agree their congregation sometimes seems to love America more than God. Most of the 1,000 Protestant pastors surveyed say their church will change its worship service to acknowledge America’s Independence Day. Two-thirds (66 percent) plan to include special music honoring America. Sixty-two percent each say they will recognize living veterans and those with family currently serving in the armed forces. Fifty-three percent will recognize families who have lost loved ones in service to our country. LifeWay Research found pastors 65 and older are more likely to say it’s important to incorporate patriotic elements in worship services the week of July Fourth (78 percent) than pastors 18-44 years old (44 percent). Pastors in the West (67 percent) are more likely to hold that view than pastors in the Northeast (55 percent) and Midwest (54 percent). Denomination also plays a role in pastors’ views on the importance of patriotic elements in worship services around the July Fourth holiday. Pentecostals (82 percent) are most likely among Protestant pastors to agree on their importance, while Baptists (67 percent) are more likely to agree than Lutherans (51 percent), Methodists (50 percent) and Presbyterian/Reformed (47 percent). A phone survey of 1,000 Protestant pastors was conducted March 9-24, 2016. The calling list was a stratified random sample, drawn from a list of all Protestant churches. Quotas were used for church size and black Protestant denominations. Each interview was conducted with the senior pastor, minister or priest of the church called. Responses were weighted by region to more accurately reflect the population. The sample provides 95 percent confidence that the sampling error does not exceed plus or minus 3.2 percent. Margins of error are higher in sub-groups.